For the luxury car companies, the next big thing is electric vehicles. Thank Tesla, tightening emissions standards and, most of all, China for that. BMW, still purported makers of the Ultimate Driving Machine, is no exception. It’s got a pretty strong hybrid lineup already and has gone even further out there with cars like the i3 city car and i8 exotic. Now we know more about what’s next. Literally, next, in this case. BMW recently made more of its electric and electrification strategy clear, and it says it’ll have five all-electric models on the market by 2021 and at least 12 by 2025. Those will be led by the iNext, a wild-looking wagon-hatch thing unveiled in concept form last year. BMW had some further details about the i4, which sounds like it’ll be poised to compete against the Tesla Model S and the like. It’s said to do zero to 62 mph (100 km/h) in four seconds, an estimated range of over 370 miles and a production set to begin in 2021. That seems to be counting on more battery and motor advancements than the iX3, which is due out next year and currently has an estimated range of about 250 miles. Also due out in 2021 is the iNext crossover—and who knows if it will keep that name or not—which is expected to match the i4 in range. 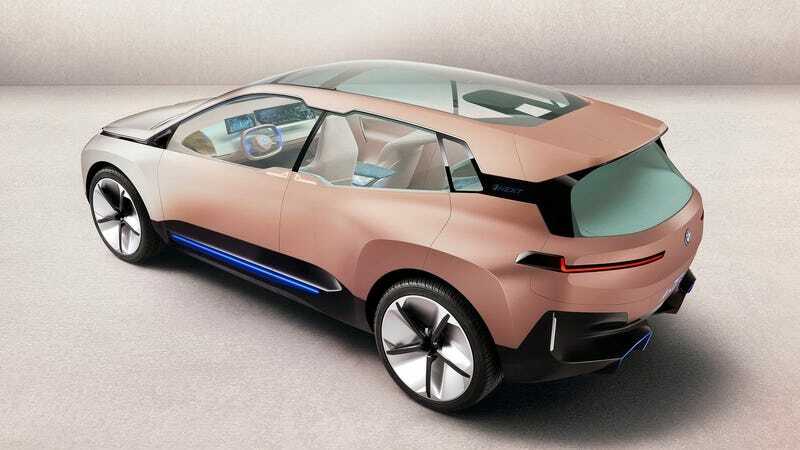 “With the proportions and dimensions of a luxury Sports Activity Vehicle, a fifth-generation electric drive unit and systems for highly automated driving, the BMW iNEXT embodies the future of driving pleasure in a particularly comprehensive way,” the automaker said. BMW says that moving forward its production methods will allow it to build hybrid, fully electric and conventional internal combustion cars on the same assembly line. It’s also teaming up with traditional rival Daimler on mobility services like car-sharing, parking and charging networks, because the future probably lies in consolidation. Like most automakers BMW is hoping the current SUV boom will help pay for the massive investment needed into electric vehicles and autonomous tech, though it has warned currency fluctuations, material costs and potential trade wars could make for a rough 2019.